Now Naomi had a kinsman on her husband's side, a prominent rich man, of the family of Elimelech, whose name was Boaz. And Ruth the Moabite said to Naomi, "Let me go to the field and glean among the ears of grain, behind someone in whose sight I may find favor." She said to her, "Go, my daughter." So she went. She came and gleaned in the field behind the reapers. As it happened, she came to the part of the field belonging to Boaz, who was of the family of Elimelech. Just then Boaz came from Bethlehem. He said to the reapers, "The LORD be with you." They answered, "The LORD bless you." Then Boaz said to his servant who was in charge of the reapers, "To whom does this young woman belong?" The servant who was in charge of the reapers answered, "She is the Moabite who came back with Naomi from the country of Moab. She said, 'Please, let me glean and gather among the sheaves behind the reapers.' So she came, and she has been on her feet from early this morning until now, without resting even for a moment." Then Boaz said to Ruth, "Now listen, my daughter, do not go to glean in another field or leave this one, but keep close to my young women. Keep your eyes on the field that is being reaped, and follow behind them. I have ordered the young men not to bother you. If you get thirsty, go to the vessels and drink from what the young men have drawn." Then she fell prostrate, with her face to the ground, and said to him, "Why have I found favor in your sight, that you should take notice of me, when I am a foreigner?" But Boaz answered her, "All that you have done for your mother-in-law since the death of your husband has been fully told me, and how you left your father and mother and your native land and came to a people that you did not know before. May the LORD reward you for your deeds, and may you have a full reward from the LORD, the God of Israel, under whose wings you have come for refuge!" Then she said, "May I continue to find favor in your sight, my lord, for you have comforted me and spoken kindly to your servant, even though I am not one of your servants." But I call on God as witness against me: it was to spare you that I did not come again to Corinth. 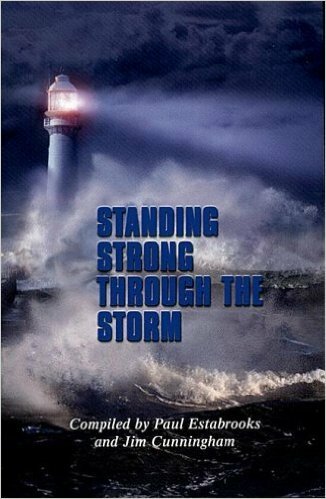 I do not mean to imply that we lord it over your faith; rather, we are workers with you for your joy, because you stand firm in the faith. So I made up my mind not to make you another painful visit. For if I cause you pain, who is there to make me glad but the one whom I have pained? And I wrote as I did, so that when I came, I might not suffer pain from those who should have made me rejoice; for I am confident about all of you, that my joy would be the joy of all of you. For I wrote you out of much distress and anguish of heart and with many tears, not to cause you pain, but to let you know the abundant love that I have for you. But if anyone has caused pain, he has caused it not to me, but to some extent-- not to exaggerate it-- to all of you. This punishment by the majority is enough for such a person; so now instead you should forgive and console him, so that he may not be overwhelmed by excessive sorrow. So I urge you to reaffirm your love for him. 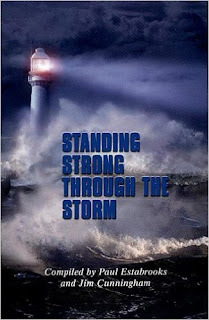 I wrote for this reason: to test you and to know whether you are obedient in everything. Anyone whom you forgive, I also forgive. What I have forgiven, if I have forgiven anything, has been for your sake in the presence of Christ. And we do this so that we may not be outwitted by Satan; for we are not ignorant of his designs. When I came to Troas to proclaim the good news of Christ, a door was opened for me in the Lord; but my mind could not rest because I did not find my brother Titus there. So I said farewell to them and went on to Macedonia. But thanks be to God, who in Christ always leads us in triumphal procession, and through us spreads in every place the fragrance that comes from knowing him. For we are the aroma of Christ to God among those who are being saved and among those who are perishing; to the one a fragrance from death to death, to the other a fragrance from life to life. Who is sufficient for these things? For we are not peddlers of God's word like so many; but in Christ we speak as persons of sincerity, as persons sent from God and standing in his presence. "You have heard that it was said to those of ancient times, 'You shall not murder' and 'whoever murders shall be liable to judgment.' But I say to you that if you are angry with a brother or sister, you will be liable to judgment; and if you insult a brother or sister, you will be liable to the council; and if you say, 'You fool,' you will be liable to the hell of fire. So when you are offering your gift at the altar, if you remember that your brother or sister has something against you, leave your gift there before the altar and go; first be reconciled to your brother or sister, and then come and offer your gift. Come to terms quickly with your accuser while you are on the way to court with him, or your accuser may hand you over to the judge, and the judge to the guard, and you will be thrown into prison. Truly I tell you, you will never get out until you have paid the last penny. Morning Devotions with Cap'n Kenny - "Not Ashamed"
It seems today that it’s open season on Christians. People attack us as intolerant, Bible-thumping bigots. 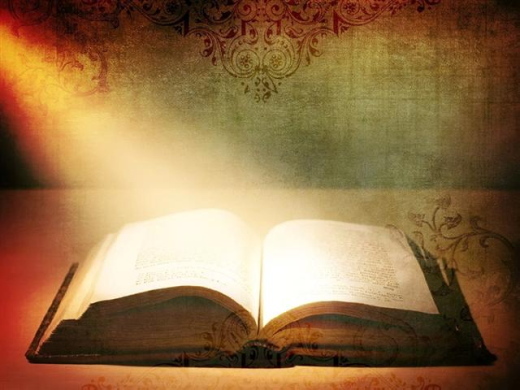 Because we believe the Bible is the inspired Word of God, we are dismissed as simple-minded fools. It’s interesting to note that when Daniel was attacked for his faith, he didn’t change a thing. As a Jew living in a foreign country, his custom was to open his windows, face Jerusalem, and call upon the name of the Lord. It was a habit of prayer. From the time that he was a young man, he always took time to pray. He established that grid in his life, and even in his nineties, he was still praying. But Daniel’s enemies had set a trap for him. They convinced the king to sign a decree that made it illegal for him to continue his daily practice of prayer. Yet for Daniel, to not pray would be a compromise. No, tell them it’s because of Jesus Christ and the change He has made in your life. Don’t be afraid. Don’t be ashamed of the gospel of Christ. Un Día a la Vez Copyright © by Claudia Pinzón. 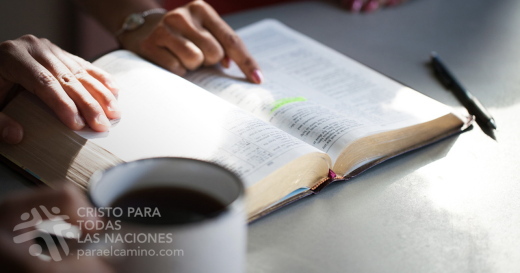 La Santa Biblia, Nueva Versión Internacional® NVI® Copyright © 1986, 1999, 2015 by Biblica, Inc.® Used by permission. All rights reserved worldwide. Versión Reina-Valera 1960 © Sociedades Bíblicas en América Latina, 1960. Renovado © Sociedades Bíblicas Unidas, 1988. Pray for desire and grace. 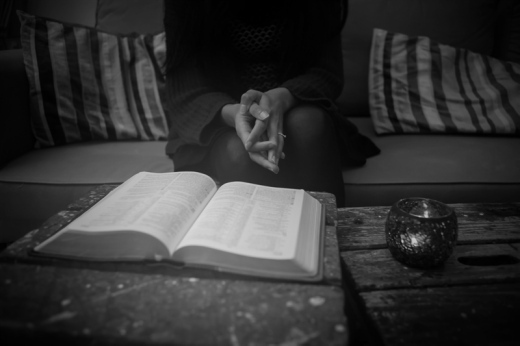 If you know you should be having a quiet time, but it feels like a struggle each and every time, ask God for the desire to meet with him, and then ask him for the grace when it comes out less than perfectly. Put your phone in another room. When things feel dry in my quiet time, I want an instant hit of connection – and that’s what social media offers. Instant connection. Put the phone out of reach so that you wait on your connection with God. 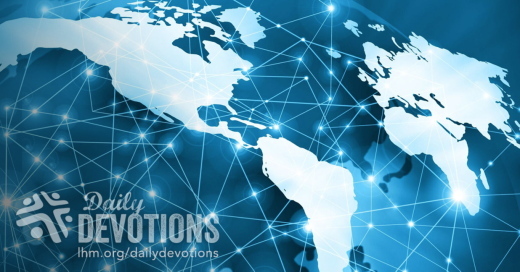 LHM Daily Devotion - "Less Than Seven Minutes"
If you have been following the news, you may have noticed that there has been an exchange of words between our new administration and Iran. As near as I can tell, every nation's new administrations, as well as most of the old administrations, have regular exchanges of words with Iran. That may be because Iran is very much dedicated to the development of nuclear power which can, and will, only be used for peaceful purposes. Now nobody should have any problem with such a promise, should they? The great difficulty with that promise is the leaders of most other nations have a hard time believing Iran when it offers such reassurances. That's because the rest of the time, when Iran's leaders speak, their words are pretty strong. • "If the enemy makes a mistake, our roaring missiles will hit their targets." • "Only seven minutes is needed for the Iranian missile to hit Tel Aviv." Seven minutes. Think about that for a moment. Seven minutes from when somebody presses a button until your world goes boom! Seven minutes isn't very much time. And you probably wouldn't have the full seven minutes. It would take time for someone to decide a missile had been launched and a little more time before someone sounded a warning. If you had seven minutes before a bomb went boom, would you be prepared? Would you be able to sit back and be content that everything was as it ought to be, or would you have a whole laundry list of things which absolutely needed to be done? Now the reason I ask is this: according to numerous places in Scripture, Jesus is going to give less than a seven-minute warning before His return. Actually, He is going to give about seven minutes less than seven minutes. Maybe that's why our Redeemer kept telling people to be prepared. And how can an average Joe or Jane be prepared? Very simple: don't fight the Holy Spirit. Let Him show you your sin and lead you to repentance. Let Him introduce you to the Savior who did all that was necessary to remove those sins and promise you safe conduct into heaven. As Paul and Silas once said to a suicidal jailer, "Believe in the Lord Jesus, and you will be saved, you and your household" (Acts 16:31b). THE PRAYER: Dear Lord, we live in a world where death can come quickly and without much warning. Today I pray that I may always be ready for the time when the Savior comes and takes me through the valley of the shadow of death. For His work and my salvation, I give thanks. In His Name. Amen. James Marshall estaba construyendo un aserradero en California, cuando descubrió oro. De acuerdo a una cadena de noticias, en un mercado de pulgas una persona (que quiere permanecer anónima) compró un cuadro de una flor. Aparentemente, los diez dólares que gastó resultaron ser una muy buena inversión. ¿Cuán buena? Al parecer, al igual que James Marshall, esta persona "encontró oro". Resulta ser que, cuando sacó la foto del marco, encontró un manuscrito de la canción patriótica "América". Dicha canción, escrita en 1831 por Samuel Francis Smith, fue designada para ayudar a las escuelas a inspirar e instruir a los niños. Cantada con la melodía familiar de "Dios Salve a la Reina" (del Reino Unido), fue ejecutada por primera vez el 4 de julio de ese mismo año en la Primer Iglesia Bautista en Newton, Massachussets. Y ahora ese manuscrito ha salido a la luz. ¿Será que es una falsificación? Varios expertos dicen que no. Si están en lo cierto, ese trozo de papel, hasta ahora desconocido, podría valer decenas de miles de dólares. Me hubiera gustado que esta historia hubiera sucedido en la época de navidad, ya que hay muchos paralelos entre ella y la visita de los pastores al Salvador. En primer lugar, algo que ha sido pasado por alto puede ser de mucho valor. Por ejemplo, la llegada del Salvador al mundo fue prácticamente inadvertida, y su tan esperada venida pasó casi desapercibida. Pero lo que Jesús logró con su vida, sufrimiento, muerte y resurrección, hace que para las almas pecadoras, sea más precioso que el oro. Eso es lo que Pablo estaba tratando de comunicar cuando escribió: "En él (Jesuristo)tenemos la redención por medio de su sangre, el perdón de los pecados según las riquezas de su gracia..." (Efesios 1:7-8a). Las riquezas de su gracia. Por gracia somos salvos. Por gracia somos adoptados en la familia de la fe de Dios. Por gracia recibimos vida eterna. Todo por gracia. Gracia que es mejor que el oro o cualquier manuscrito antiguo. ORACIÓN: Querido Padre celestial, gracias por los dones que nos das y que muchas veces no vemos o no reconocemos. Perdónanos por nuestra falta de visión, y ayúdanos a comprender cada vez más quién es Jesús y lo que él ha hecho por nosotros. En su nombre. Amén. Jesus’s teaching about absolute ideals and absolute grace seem contradictory. Jesus never lowered God’s perfect ideal. In His response to the rich young ruler, He said, “Be perfect, therefore, as your heavenly Father is perfect” (Matt. 5:48). He told an expert in the law who inquired as to the greatest commandment, “Love the Lord your God with all your heart and with all your soul and with all your mind” (22:37). No one has completely fulfilled those commands. Yet the same Jesus tenderly offered absolute grace. He forgave an adulteress, a thief on the cross, a disciple who had denied ever knowing Him, and a man named Saul, who had made his mark persecuting Christians. 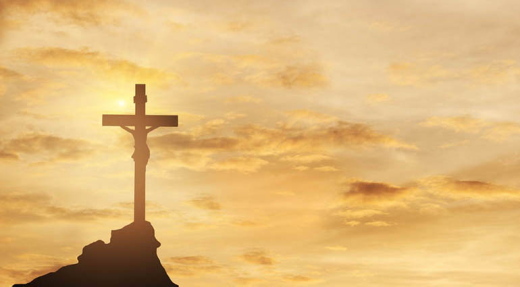 Grace is absolute and all-encompassing, extending even to those who nailed Jesus to the cross: “Father, forgive them, for they do not know what they are doing” were among the last words He spoke on earth (Luke 23:34). For years I felt so unworthy when considering Jesus’s absolute ideals that I missed any notion of His grace. Once I understood this dual message, however, I went back and found that the message of grace gusts through Jesus’s life and teachings. Grace is for the desperate, the needy, the broken, those who cannot make it on their own. Grace is for all of us. Father, Your all-encompassing grace washes over us and astonishes us. May we live today as people who enjoy Your complete forgiveness and a restored relationship with You. Jesus fulfilled the perfect requirements of the law so that we may enjoy the perfect peace of His grace. Sự dạy dỗ về tiêu chuẩn tuyệt đối và ân sủng tuyệt đối của Chúa Jêsus dường như trái ngược nhau. Chúa Jêsus không bao giờ hạ thấp tiêu chuẩn tuyệt đối. Khi trả lời viên quan trẻ tuổi, Chúa Jêsus nói: “Thế thì các con phải nên toàn thiện như Cha các con ở trên trời là toàn thiện” (Ma-thi-ơ 5:48). Đối với chuyên gia kinh luật, là người hỏi Ngài điều răn lớn nhất là gì, Ngài nói: “Ngươi phải hết lòng, hết linh hồn, hết tâm trí mà kính mến Chúa là Đức Chúa Trời ngươi” (22:37). Chưa có ai làm được những điều răn này cách trọn vẹn. Thế nhưng cũng chính Chúa Jêsus lại hứa ban ân điển tuyệt đối. Ngài tha thứ cho một người phụ nữ phạm tội ngoại tình, và một người nam tên là Sau-lơ, người nổi tiếng bắt bớ Cơ Đốc nhân. Ân điển thì vô điều kiện và dành cho mọi người, bao gồm cả những người đã đóng đinh Chúa Jêsus lên thập tự giá: “Lạy Cha, xin tha cho họ vì họ không biết mình làm điều gì” (Lu-ca 23:34). Khi suy nghĩ về những tiêu chuẩn tuyệt đối của Chúa Jêsus, suốt nhiều năm tôi thấy mình thật không xứng đáng đến mức tôi quên mất ý niệm về ân sủng của Chúa. Tuy nhiên, khi tôi hiểu thông điệp hai mặt này, tôi đã quay trở lại và thấy sứ điệp ân sủng tràn ngập trong cuộc đời và lời dạy của Chúa Jêsus. Ân sủng dành cho những kẻ vô vọng, những người nghèo khó, những tấm lòng tan vỡ, những ai không thể tự nỗ lực bằng sức riêng. Ân sủng dành cho tất cả chúng ta. Lạy Cha, ân sủng của Ngài đã nhuần gội trên chúng con và làm chúng con kinh ngạc. Nguyện hôm nay chúng con sống như những người đã hưởng sự tha thứ hoàn toàn của Ngài và được phục hồi mối tương giao với Ngài. Chúa Jêsus làm trọn những đòi hỏi hoàn hảo của luật pháp để rồi chúng ta có thể vui hưởng sự bình an trọn vẹn của ân điển Ngài. … Jesús le dijo: Ni yo te condeno… (Juan 8:11). L a enseñanza de Jesús sobre los ideales absolutos y la gracia total parece contradictoria. Jesús nunca rebajó el ideal de la perfección. Al joven rico, le dijo: «Sed, pues, vosotros perfectos, como vuestro Padre que está en los cielos es perfecto» (Mateo 5:48). Y a un experto en la ley, que le preguntó sobre el mandamiento más importante, le explicó: «Amarás al Señor tu Dios con todo tu corazón, y con toda tu alma, y con toda tu mente» (22:37). Nadie ha cumplido perfectamente estos mandamientos. Sin embargo, el mismo Jesús ofrece tiernamente gracia total. Perdonó a una adúltera, a un ladrón en la cruz, a un discípulo que negó conocerlo y a un hombre llamado Saulo que perseguía a los cristianos. La gracia es absoluta y para todos, y alcanza incluso a aquellos que clavaron a Jesús en la cruz. «Padre, perdónalos, porque no saben lo que hacen» rogó el Señor mientras agonizaba (Lucas 23:34). Durante años, me sentía tan indigno al considerar los ideales absolutos de Jesús, que no captaba la idea de la gracia. Sin embargo, cuando entendí este mensaje dual, descubrí que el concepto de la gracia emana a través de la vida y las enseñanzas de Cristo. La gracia es para todos los que no pueden seguir adelante por sí solos. La gracia es para todos. Señor, tu gracia me asombra. Quiero hoy disfrutarla. Jesús cumplió los requisitos perfectos de la ley para que podamos disfrutar de la paz perfecta de su gracia. Dass Jesus absolute Ideale und absolute Gnade predigte, scheint widersprüchlich. Jesus hat Gottes absolute Ideale nie herabgesetzt. In der Bergpredigt sagt er: „Ihr sollt vollkommen sein, wie euer Vater im Himmel vollkommen ist“ (Matth. 5,48). Einem Gesetzeslehrer, der wissen wollte, welches das höchste Gebot ist, erwiderte er: „Du sollst den Herrn, deinen Gott, lieben von ganzem Herzen, von ganzer Seele und von ganzem Gemüt“ (Matth. 22,37). Keiner hat diese Gebote je vollkommen erfüllt. Und doch hat derselbe Jesus absolute Gnade angeboten. Er vergab einer Ehebrecherin, einem Dieb am Kreuz, einem Jünger, der geleugnet hatte, ihn zu kennen, und einem Mann namens Saulus, der sich dadurch ausgezeichnet hatte, dass er die Christen verfolgte. Gnade ist absolut und allumfassend und gilt selbst für die, die Jesus ans Kreuz nagelten: „Vater, vergib ihnen, denn sie wissen nicht, was sie tun“, sind einige der letzten Worte, die er auf der Erde sprach (Luk. 23,34). Jahrelang kam ich mir, wenn ich an Jesu absolute Ideale dachte, so unwürdig vor, dass ich seine Gnade gar nicht begriff. Doch nachdem ich die doppeldeutige Botschaft verstanden hatte, stellte ich fest, dass die Botschaft der Gnade Jesu ganzes Leben und Lehren durchdringt. Gnade ist für die Verzweifelten, die Bedürftigen, die Zerbrochenen, für alle die, die es allein nicht schaffen. Die Gnade ist für uns alle. Vater, deine allumfassende Gnade überströmt und verblüfft uns. Lass uns heute als Menschen leben, die sich an deiner Vergebung und der geheilten Beziehung zu dir freuen. Jesus hat die vollkommenen Anforderungen des Gesetzes erfüllt, damit wir in seiner Gnade vollkommenen Frieden erleben können. Jésus n’a jamais réduit l’idéal parfait de Dieu. Il a répondu au jeune riche : « Soyez donc parfaits, comme votre Père céleste est parfait » (MT 5.48). Puis il a répondu ainsi au docteur de la loi qui s’enquérait du plus grand commandement : « Tu aimeras le Seigneur, ton Dieu, de tout ton coeur, de toute ton âme, et de toute ta pensée » (22.37). Or, personne n’a jamais obéi à ces commandements à la perfection. Pourtant, fidèle à son infinie bienveillance, le même Jésus a offert sa grâce absolue à tout un chacun. Il a pardonné à la femme adultère, à un brigand crucifié à ses côtés, à un disciple qui avait nié le connaître et à un dénommé Saul, qui avait pris du galon en persécutant les chrétiens. La grâce est absolue et universelle ; Dieu l’a étendue même à ceux qui l’ont cloué à la croix : « Père, pardonne-leur, car ils ne savent ce qu’ils font » (LU 23.34). Devant les idéaux absolus de Jésus, je me suis senti indigne de lui pendant de nombreuses années au point d’être incapable de saisir le sens de sa grâce. Toutefois, dès l’instant où j’ai compris ce double message, je suis revenu sur le sujet et j’ai alors découvert que le message de la grâce divine souffle en rafales par la vie et les enseignements de Jésus. La grâce est réservée à ceux qui sont désespérés, qui sont dans le besoin, qui ont le coeur brisé et qui ne peuvent s’en sortir par leurs propres forces. La grâce divine nous est donc destinée à tous. L’accomplissement parfait de la loi nous procure la paix parfaite. Здається, існує деяка суперечність між вченням Ісуса про абсолютні моральні стандарти і вченням про абсолютну благодать. Але Ісус ніколи не принижував Божі досконалі вимоги. В Нагорній проповіді Він сказав: “Будьте досконалі, як досконалий Отець ваш Небесний!” (Мт. 5:48). Книжнику, який запитав про найбільшу заповідь в Законі, Господь сказав: “Люби Господа Бога свого всім серцем своїм, і всією душею своєю, і всією своєю думкою” (Мт. 22:37). Але ніхто цілковито не виконав цих заповідей. Тому Ісус в той же час ніжно пропонував абсолютну Божу благодать. Він простив перелюбницю, розбійника на хресті, учня, що зрікся свого Вчителя, і помилував Савла, який жорстоко переслідував християн. Божа ласка охоплювала всіх – навіть тих, хто прибивали Ісуса цвяхами до хреста. “Отче, відпусти їм, бо не знають, що чинять вони”, – молився Він (Лк. 23:34). Протягом багатьох років я почував себе неповноцінним, бо зважав лише на абсолютні стандарти Христа, цілком забуваючи при цьому Його ласку. Коли ж я зрозумів подвійну природу Благої Звістки, то повернувся до ідеї благодаті й побачив, що вона пронизує життя і вчення Ісуса. Благодать пропонується нужденним, зламаним духом – тим, хто у розпачі від неспроможності власними силами досягати Божих стандартів. Отче, Твоя безмірна ласка вражає нас. Допоможи нам жити і радіти цілковитому прощенню і відновленим стосункам з Тобою. Ісус виконав цілковито всі вимоги закону, щоб ми могли цілковито радіти Його благодаті. Учения Иисуса Христа о совершенных стандартах и совершенной благодати кажутся противоречащими одно другому. Иисус никогда не занижал Божьи совершенные требования. В Нагорной проповеди Он сказал: «Будьте совершенны, как совершен Отец ваш Небесный» (Мф. 5:48). Законнику, спрашивавшему Его о наибольшей заповеди, Он ответил: «Возлюби Господа, Бога твоего, всем сердцем твоим, и всей душой твоей, и всем разумением твоим» (Мф. 22:37). Ни один человек не смог исполнить этих заповедей. Но тот же Иисус принес в мир совершенную благодать. Он прощал блудниц, обещал спасение разбойнику на кресте, оказал милость ученику, который трижды отрекся от Него, и жестокому Савлу, прославившемуся преследованием христиан. Благодать – это совершенное сострадание, распространившееся даже на тех, кто пригвоздил Иисуса ко кресту. «Отче! Прости им, ибо не знают, что делают», – молился Он о них (Лк. 23:34). Многие годы я чувствовал себя крайне ущербным, думая о совершенных требованиях Иисуса и забывая о Его удивительной благодати. Но затем, осознав двойственность этой истины, я вернулся и обнаружил, что весть о благодати проходит через всю жизнь и учение Христа. Благодать дается отчаявшимся и сокрушенным, которые не могут помочь себе сами. Благодать предназначена для всех нас. Отче, Твоя удивительная благодать изумляет нас. Помоги нам жить, постоянно радуясь Твоему совершенному прощению и живому общению с Тобой. Иисус исполнил совершенные требования закона, чтобы мы могли обрести совершенный мир в Его благодати.